Reverse mortgages may be getting a positive reception in press outlets and the financial planning community, but there are still some myths and questions that remain among prospective borrowers. A webinar panel hosted by the National Reverse Mortgage Lenders Association and Next Avenue — an information outlet for individuals 55 and over — aimed to address some of those questions and concerns on Tuesday, in addition to fielding questions from a consumer audience. 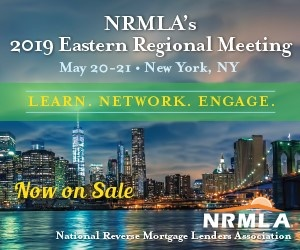 The panel, held as a part of Reverse Mortgage Education Week, included representatives from NMRLA, the reverse mortgage lending community, the National Council on Aging, publication Magnify Money and the financial planning industry. It aimed to clarify and define terms around home equity lines of credit versus reverse mortgages, advantages and disadvantages of reverse mortgages, using a Home Equity Conversion Mortgage to complete home modifications for aging in place, and buying a home with a HECM for Purchase. It also took audience questions from attendees, which consisted of those who learned about the webinar via the Next Avenue outlet. “Can borrowers make payments toward principal or pay off the loan early?” one attendee wrote to the panel. The clarification points to a strategy that some originators are marketing to borrowers: making early payments on the reverse mortgage, thus satisfying some of the debt before the loan comes due. Another attendee posted a question about paying all closing costs out of pocket to maximize the available line of credit, keep a balance of zero on the loan, and avoid accruing interest on it. Other attendees asked for explanations about the difference between fixed-rate and adjustable-rate reverse mortgages, and jumbo versus Federal Housing Administration-insured reverse mortgages. A final question asked whether there is an annual income minimum requirement for a HECM. While the Financial Assessment portion of the reverse mortgage will examine credit and income, there are scenarios where someone can get a reverse mortgage without income, Hultquist responded. The panelists all agreed that home equity is an important retirement tool, when used in the right way. “For listeners and advisors, I want them to understand the importance of taking a holistic approach [to retirement] and that the home is an important asset to include,” said Marguerita Cheng, CFP, CEO of Blue Ocean Global Wealth.